As you may have noticed, the Food industry never ceases to evolve. Each year we can see numerous product introductions and particularly in the dairy aisle. New brands, new milk types, new ingredients, new flavors, new formats - you name it. A drastic change from what the U.S. dairy aisles used to offer. The recent appetite for “full-fat-is-good-fat” dairy products naturally paved the way for the latest revolution: French yogurt. NOW, WHAT MAKES FRENCH YOGURT "FRENCH"? Traditionally, French yogurt uses whole milk boasting a unique rich texture. Ingredients are usually directly poured into the same pots the yogurt will be consumed in. Each pot, which is typically made from glass, is then put aside in a hot room to set for hours and voilà! This is a unique process which allows the yogurt to have a firm texture: hence the name “cup-set”. The Washington Post describes it as having a "luxuriously smooth, creamy texture". HOW IS FRENCH YOGURT DIFFERENT FROM GREEK YOGURT? First of all, the technique: Greek yogurt is produced in large vats and then poured into cups. As explained above, French yogurt uses a cup-set technique. Second, the texture: Greek yogurt is strained to remove the whey, giving it a thick texture and a tangy feel. On the other hand, French yogurt is made using whole-milk and is unstrained, which means all nutrients are kept, giving it a rich and creamy texture, with a sweet taste. Third, the ingredients: There is a growing trend for simple, “readable” ingredient list on the market, which affects all yogurt types. However, traditional French yogurt has always been made using simple and few ingredients: milk, cultures, sugar and fruits. Additionally, French yogurt typically uses whole-milk, bringing in some full, healthy fat to the recipe. Born in the South of France in 1952, La Fermière is now proud to introduce its premium, all-natural French yogurt to the U.S. Market. Its heavenly indulgent yogurt collection is produced locally, using the exact same recipes as France, since 1952. 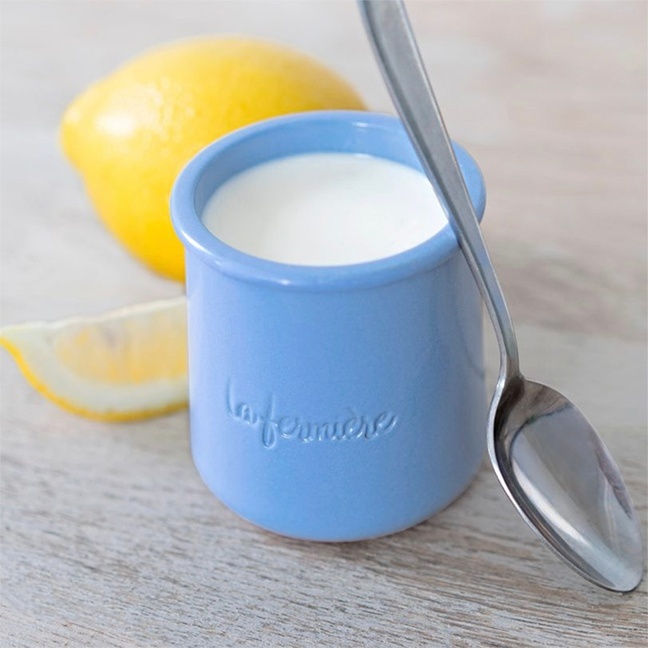 As per the French tradition, La Fermière serves its yogurt in glass and blue terra-cotta pots, reminiscent of its roots in the French Riviera.